Summary: God punishes sin. God provides a healing from poisonous snakebites in the wilderness for the Israelites that turn to Him in faith and look upon the bronze serpent. Jesus is the only remedy for our sin. The children of Israel had been wandering in the wilderness. They were tired, thirsty, hungry, and complaining. They were blaming God for their problems. They wanted more than the manna God was providing each day. They wanted to go back to their old way of life in Egypt where they were slaves. This was a sin and God punished them by sending lots of poisonous snakes among them. Can you imagine the people starting to scream “Oh no! Snakes!” and trying to get away from them? A lot of people died from the snakebites. Then they realized they had done something wrong and turned away from (or repented of) their sin. They asked Moses to pray that God would take away the snakes. But God didn’t do that. He gave them a choice. The Brazen Serpent by Gustave Doré (1832-1883). 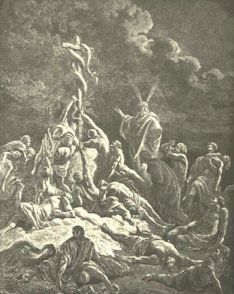 Scan courtesy of The Doré Bible. God told Moses to make a bronze snake and put it on a pole. If a person was bitten, he could continue to look down at the snakes and die or he could look up at the pole in faith and live. God was providing a remedy or cure for the poisonous sin in his life. God has always treated his children the same from the beginning of time. In the Garden of Eden the choice was to obey (by not eating the forbidden fruit) and live, or sin (by eating it) and die. Jesus explained the meaning of the story of the snakes to Nicodemus. (Read John 3:14-15) Jesus said that God was going to lift him up on the cross as a sacrifice for the sins of everyone. Those that look to the cross and see Jesus in place of their sin will live forever. Jesus is the only cure for the sin in our lives. When the bitten Israelites looked up at the bronze snake, they were not only admitting their sin but also looking to the Savior in faith. They were not saved by what they saw but by their faith in God. * God has always provided a way for us to be saved. We can be thankful that he sent Jesus to be lifted up on the cross for us.